The TARDIS has been pulled from its course and materialised in a rambling old Priory, somewhere in the English countryside. 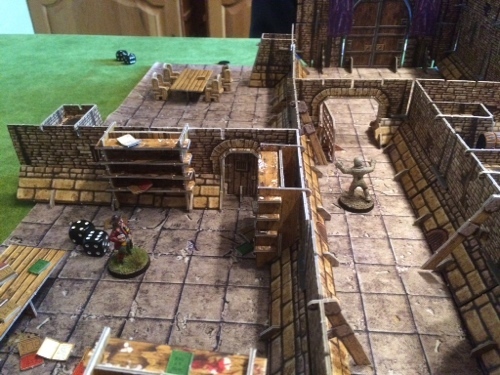 A mysterious Egyptian called Namin has taken up residence and the owner, Marcus Scarman, is missing - last seen at an archaeological dig just outside Cairo. Worried about Marcus' prolonged absence, Dr. Warlock began a desperate search for his friend and pushed his way past the butler, Collins, to discover the truth that he believed was hidden somewhere in the priory. 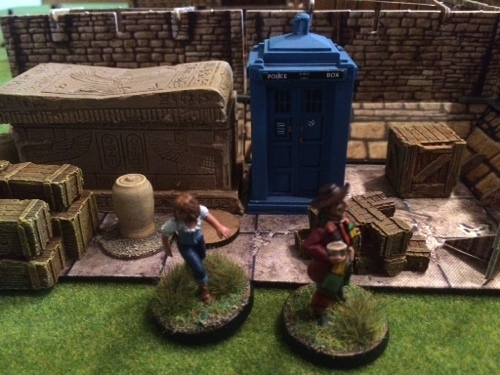 After a close encounter with Namin and his robot mummies, Warlock and The Doctor together with Sarah Jane and Collins escaped through an old priest hole. Although they didn't find Marcus, they did find an old scroll with hieroglyphs that describe an ancient relay device hidden within an Egyptian tomb. After emerging from a cave entrance, the group fled through the woods hoping to seek refuge with Marcus' brother Laurence. But they are pursued by Namin's mummies. 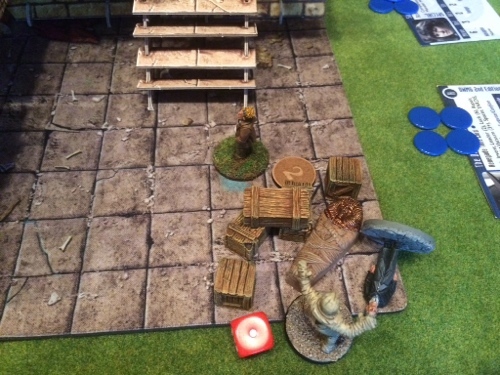 Just as they are nearing safety, A bandaged hand reached out and choked the life from Warlock. The Doctor rubbed his head and staggered to his feet. After stumbling back to the lodge, The Doctor is determined to rescue Sarah from the clutches of Namin. "We can sneak back in through the cave", suggests Collins. "Yes!" exclaims The Doctor, "But we'd best split up. Take Laurence through the secret passage and I'll find my own way in through a window." 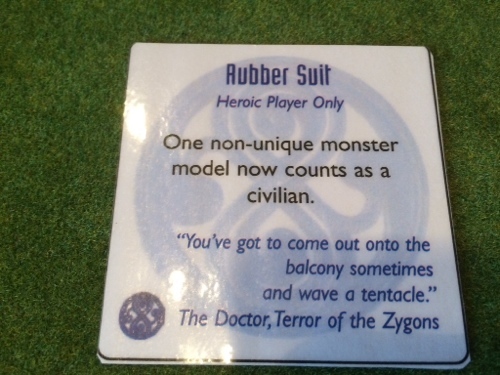 [Since The Doctor had to find an unlocked window he would enter play after D3 turns - Kyle rolled a 4, so turn 2]. 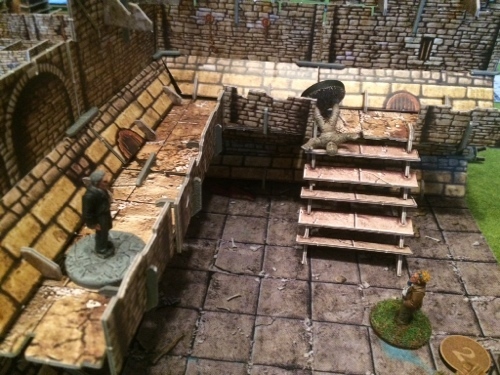 Laurence and Collins emerge from the priest hole. "I say!" exclaimed Laurence, "I bet she's hidden in a sarcophagus!" 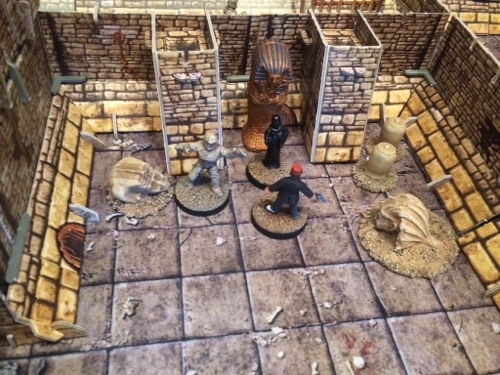 Whilst Laurence is searching for Sarah, Namin enters the priory through the hall and scurries along the corridors to communicate with Sutekh. Meanwhile The Doctor finds the window to the library unlocked. He opens it and climbs through. "Hmm" he muses, "should be able to find something useful here..."
Laurence finds nothing amongst the dusty boxes, but his actions attract the attention of a robot mummy. 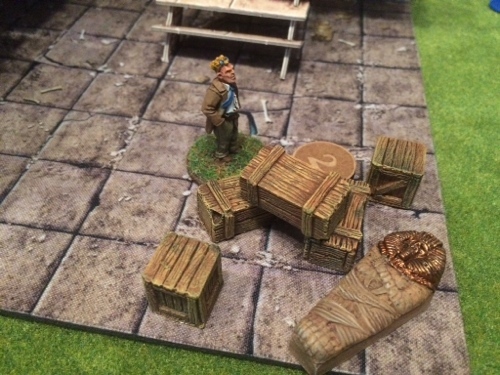 Luckily Laurence has brought his rifle and when he hears the door open he spins around and shoots the mummy square in the chest! 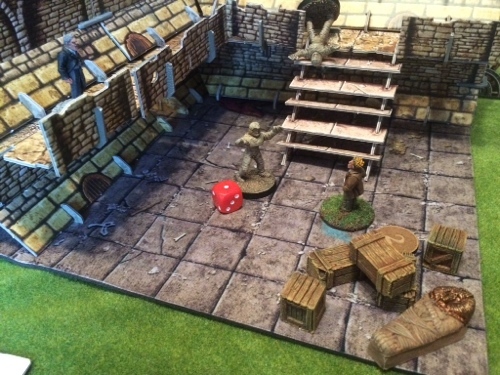 But the mummy climbs the stairs and heads straight towards Collins! Taking aim, Laurence fires again. 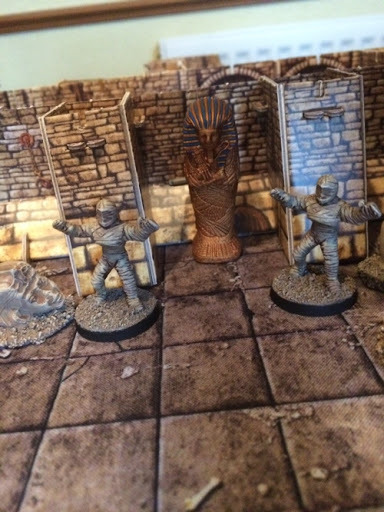 The mummy staggers and then falls! While The Doctor continues to work on his invention, Namin reaches the communication device. Sutekh speaks... And grants the gift of another robot mummy! "Kill them!" commands Namin, "Kill them all!" 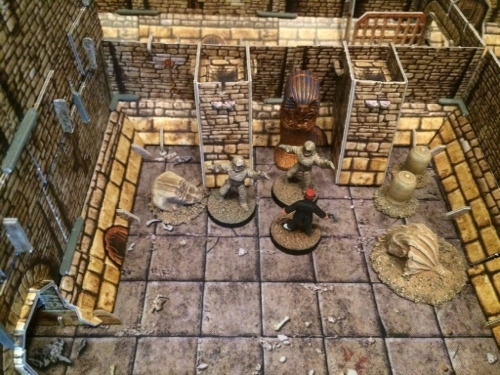 The mummy enters Laurence's room and shuffles towards the stairs. Again Laurence fires. The mummy staggers but remains standing. Collins panicks and leaps from the balcony. He runs across the room and takes refuge behind some crates. 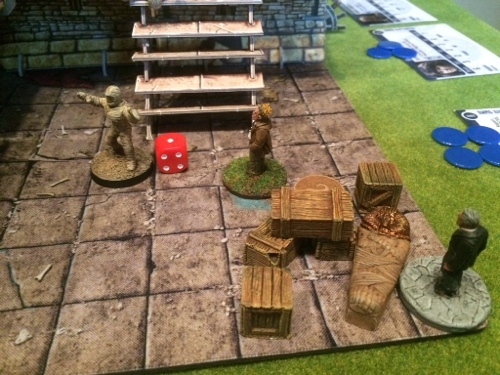 Bullets bounce off the mummy as it shuffles towards Collins. 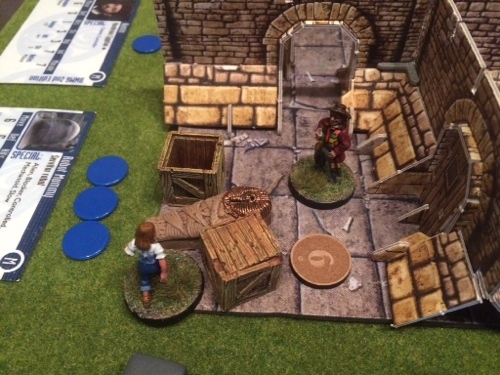 The mummy pushes aside the boxes and grabs Collins who is crushed to death. 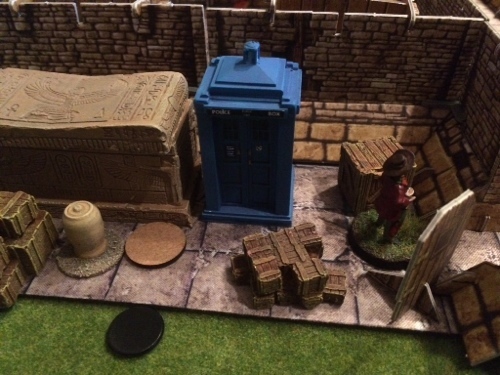 Another mummy heads off towards the library, but The Doctor has made a breakthrough and discovered how to block the signal that controls the robot mummies. 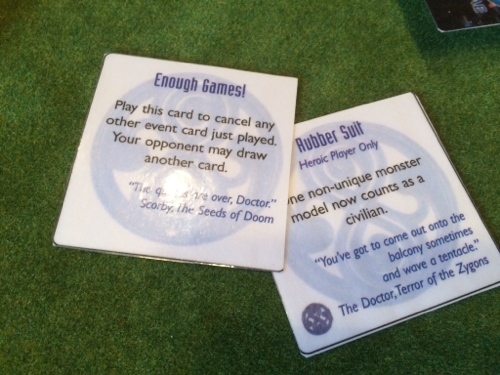 The Doctor adjusts his sonic screwdriver and the mummy suddenly lurches to the side crashing into a wall! 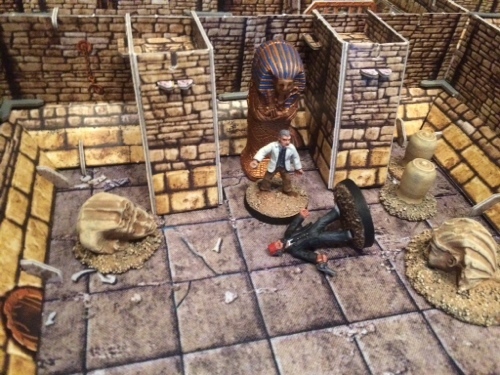 Seeing his chance, The Doctor sprints past the mummy and flings open the lid of a sarcophagus. Inside is Sarah Jane, a little shaken but otherwise unharmed. "Doctor! ", cries Sarah, "Let's get away from this beastly place!" "We will Sarah, but first we must stop Sutekh or he will destroy Earth!" Namin calls once more upon Sutekh for assistance. The communication device pulsates and a dark figure appears. "Sutekh grants a gift" it announces. "Sutekh grants the gift of death!" Grabbing Namin, Sutekh's minion discharges a pulse of energy and Namin drops to the ground dead. "Sutekh needs only one servant!" The minion seems to shimmer and then transforms into the pale, ghost like incarnation of Marcus Sharman! Marcus turns to the communication device. "Build me a rocket!" Sutekh demands. "Build me a rocket that will free me from these bonds!" "Did you hear that Doctor?" exclaimed Sarah Jane. "The voice sounded like it came from inside my head." "Yes Sarah. Sutekh's psychic powers are growing stronger. We must hurry!" Suddenly there's a noise behind them. "But we'll have to do something about that robot mummy first!" Using his jammer to disable the pursuing mummy, The Doctor leads Sarah Jane back to the storeroom. "But I don't understand Doctor! Why can't we just leave? We know Sutekh doesn't destroy Earth. I'm from the future, he can't destroy it!" The Doctor and Sarah Jane enter the TARDIS. "Where are we?" asks Sarah Jane. "Earth" replies The Doctor. "This is the future Earth if Sutekh frees himself from his prison"
Back in 1911, Laurence continues to struggle with a seemingly endless onslaught of robot mummies. 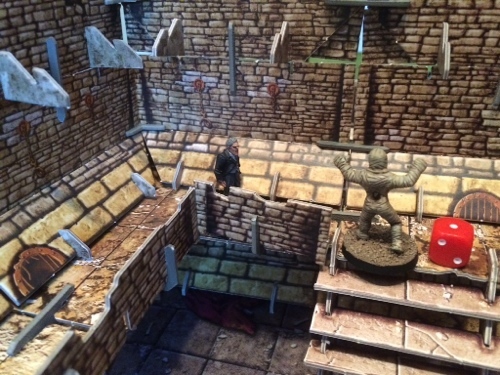 Despite his sure aim, he realises that he can't fight his way further into the priory. 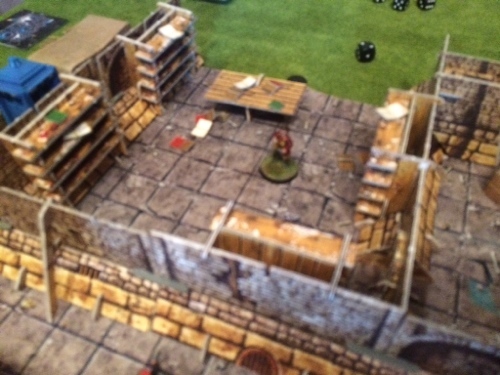 Pursued onto the balcony, he climbs into the priest hole and escapes. 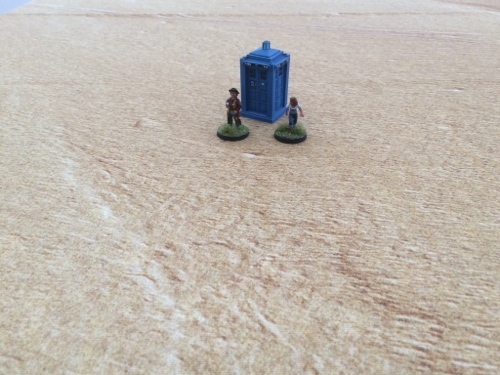 The TARDIS rematerialises in the storeroom. The Doctor and Sarah Jane check that they are alone before leaving the TARDIS and opening a window. They then climb through, back into the grounds of the priory. "You see Sarah. We can't just leave. Now come on there's a rocket to stop!" Stay tuned for Hit the Hut! Thanks, it was a fun game! 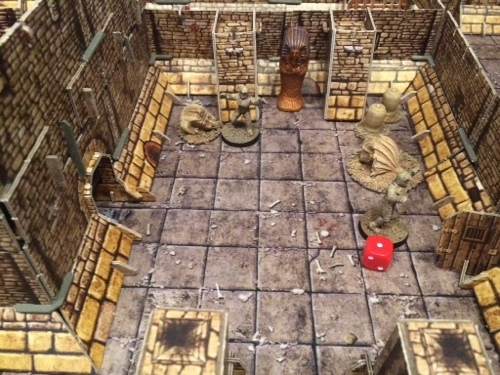 Wonderful, the dungeon terrain is amazing! Thanks Micheal. 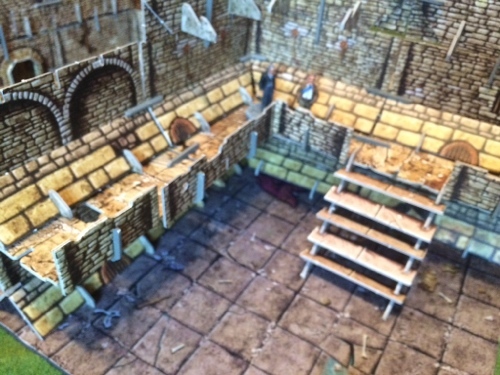 The dungeon terrain is from the Battlesystems Kickstarter - with a few extras added for effect. Loving this! Look forward to the next episode! Thanks Girdon. 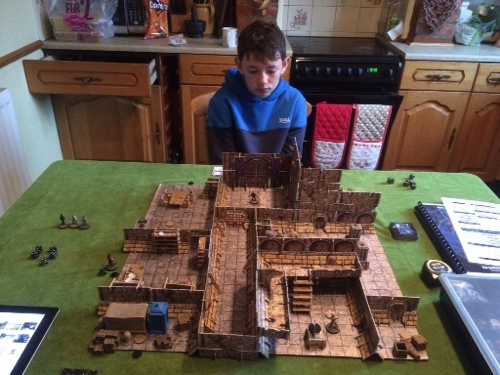 Kyle is off on a school trip, so not sure when the next game will be - soon hopefully! Bad guys? That's a matter of perspective - or at least which side you are playing! 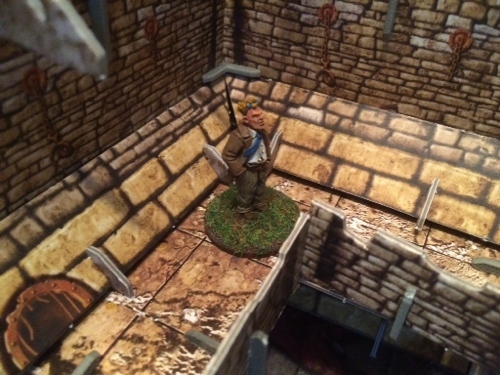 Bolt Action Four Army Battle Report! Polish Inaugural Fight! I Mostly Paint At Night...Mostly.